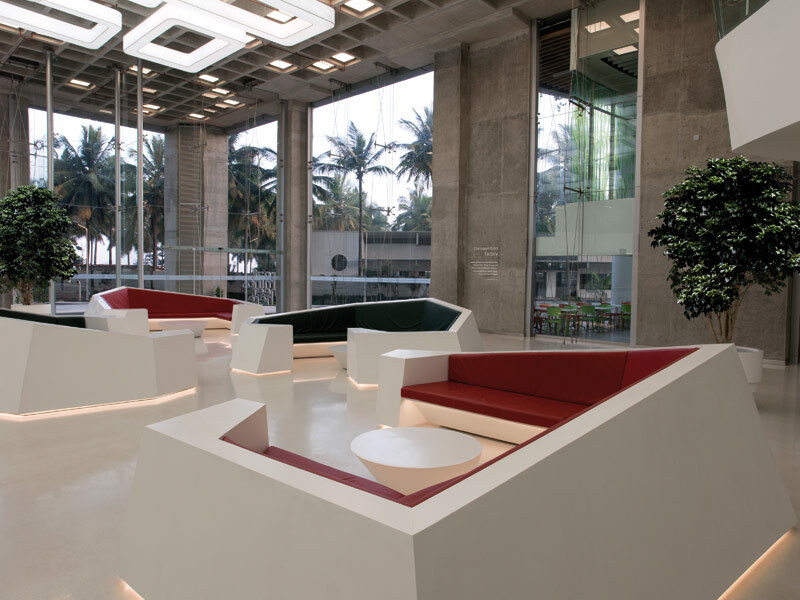 Collaborative Architecture, a Mumbai and Beijing-based practice, has delivered a 'multifunctional public space' for Bearys Global Research Triangle's (BGRT) offices in Bengaluru (Bangalore), the third biggest city in India. The practice was given a complex brief to transform the office lobby space to include a variety of 'zones', including one for relaxing, waiting and transition, in addition to providing a space for private meetings. The result is a highly dynamic space, which reflects the geometry of the structural system, earning the project name 'Reflected Topography'. Firstly examining key issues, including identifying what makes a 'typical' office lobby, Collaborative Architecture explored whether a reception space can trigger meaningful social interactions. Other key issues tackled by the practice included corporate identity within the design scheme and those around strategies for creating a successful public space design in a highly secured and controlled business campus. Further challenges faced by the practice included a requirement to meet a sustainability agenda, to integrate with the building's existing LEED Platinum certification. The practice says that while it is sensitive to the energy footprint left by all its projects, the BGRT project 'pushed the boundaries of innovation, which set a bench mark for an out-of-the box design and sustainability agenda. 'The design had to conform to the guidelines of highest LEED standards and to do little intervention as possible with in the space,' say Lalita Tharani and Mujib Ahmed, principal architects at Collaborative Architecture. 'Most of the structural shell is kept as it was, without any forced finishes; the selection of specifications have been stringent and followed the norms of LEED certified products. The lobby is dominated by a central column that supports a waffle-slab system, and is the axis for spatial orientation with the design scheme. 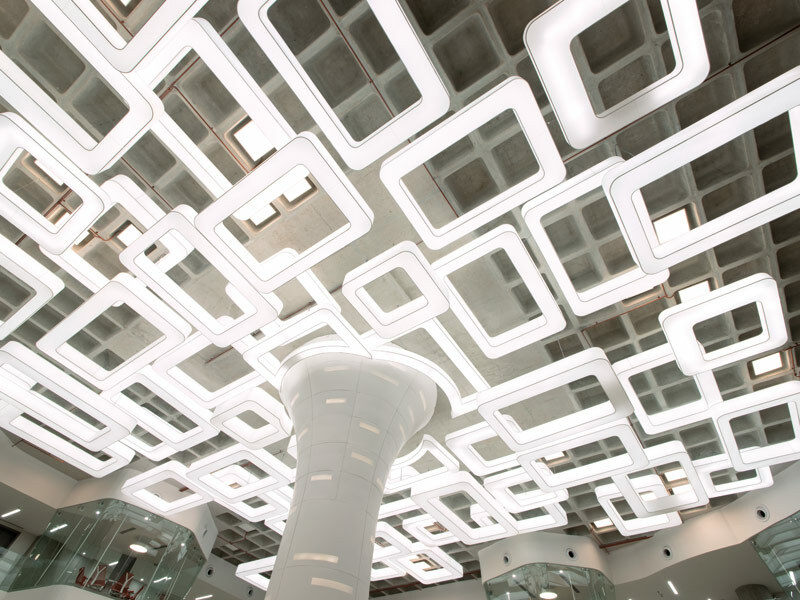 But it is the architectural lighting that plays the lead role in the overall architectural identity, which stems from the central column as foliage into the lobby space. The column is clad with Corian panels that include special details to allow access for maintenance and service. The waffle-slab system is left exposed to highlight the structural clarity of the space - one of the earliest design decisions made by the practice, which it says has paid dividends. 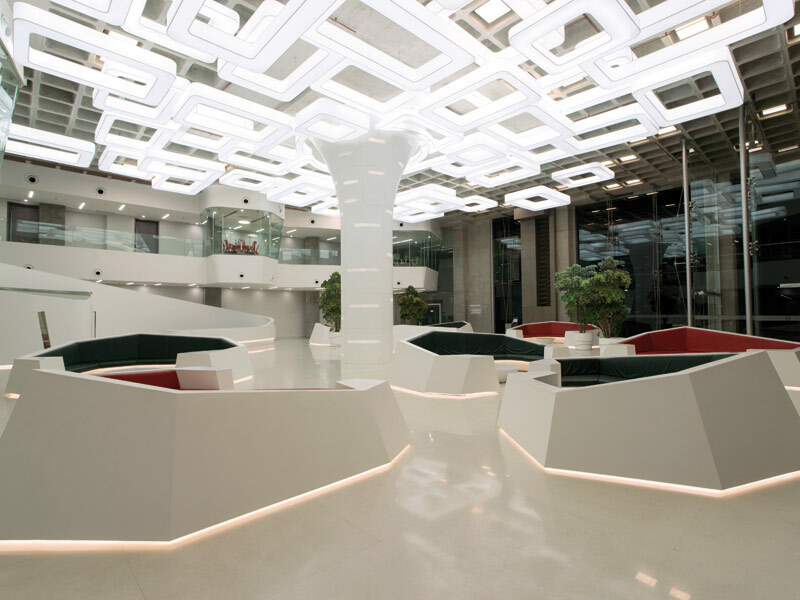 The practice also designed cluster-seating to feature in the lobby to trigger social interactions and to create an 'undulating topography of contoured volume at eye level', which complement the ceiling's undulating pattern. Strip lights highlight the base of the sofa clusters to create a dynamic pattern, and is an integral part of the overall design. 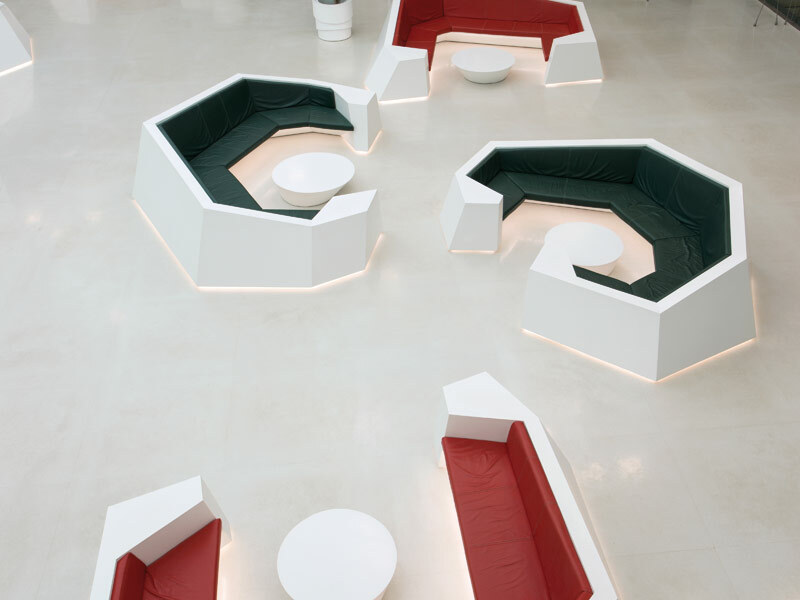 Collaborative Architecture says the seating plays the most unusual element in the scheme. Its geometric form makes it appear to be uncomfortable, and to start off with the client was unwilling to accept it. 'The studio had invested a lot of time in the ergonomic research to make the cluster seating a real experience, other than its obvious advantage over conventional seating for social bonding and better interactions,' Tharani and Ahmed explain. But the practice put an unconventional challenge to the client: 'If the client could complete his siesta on the prototype, we could go ahead as it had been originally designed. The sofa won the challenge!' Cantilevered meeting rooms were added to the existing mezzanine slab for those requiring use of a more private area, but the practice has succeeded in challenging the idea of a conventional lobby space and transforming it to a highly usable area.